Dream on Wednesday added three more bouts to its year-end Dynamite!! 2010 fight card. It’s actually more like two and a half bouts. 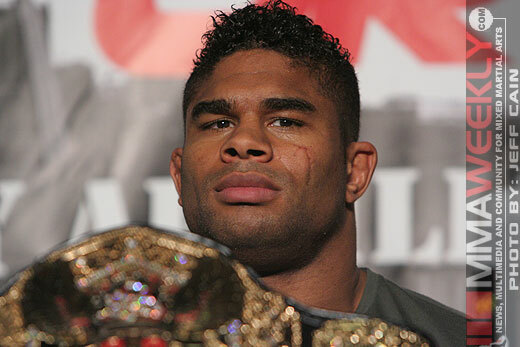 Strikeforce heavyweight champion and K-1 World Grand Prix champion Alistair Overeem has been added to the card, but the promotion has yet to name his opponent. Former UFC fighter Todd Duffee on Tuesday posted on his Facebook page, saying he was fighting Overeem on New Year’s Eve on HDNet. Dream has not announced Duffee, or anyone else, as Overeem’s opponent on New Year’s Eve, and MMAWeekly.com has thus far been unable to confirm that it will indeed be Duffee. Duffee has also removed the post from his Facebook wall. It is quite common for Dream to entertain multiple opponents for high profile fighters such as Overeem and not announce the final selection until days before the fight. Other Dynamite!! 2010 bouts that Dream did release on Wednesday include former K-1 World Grand Prix champion Jerome LeBanner in a mixed martial arts bout against Olympic Judo gold medalist Satoshi Ishii. LeBanner is 3-1-1 in mixed martial arts competition, but hasn’t fought under MMA rules since defeating Jimmy Ambriz at K-1 Hero’s 4 in March of 2006. Ishii is 3-1 with all of his bouts taking place since his debut in December 2009. Russian fighter Sergei Kharitonov will also return to the ring for the first time in more than a year and a half to face Tatsuya Mizuno. Kharitonov lost his last time out, to Jeff Monson at Dream 8. That followed three straight MMA victories, including a knockout of Overeem in 2007. Mizuno is a journeyman that lost to Gegard Mousasi in September, which followed a successful three-fight run that included a submission victory over Melvin Manhoef.